↑ 2.0 2.1 2.2 2.3 2.4 2.5 2.6 Single, G.; Dickman, C. R.; MacDonald, D. W. (2001). "Rodents". In MacDonald, D. W. The Encyclopedia of Mammals (2nd ed.). Oxford University Press. pp. 578–587. ISBN 978-0-7607-1969-5. ↑ 3.0 3.1 Müller, J.; Clauss, M.; Codron, D.; Schulz, E.; Hummel, J.; Kircher, P.; Hatt, J. M. (2014). "Tooth length and incisal wear and growth in guinea pigs (Cavia porcellus) fed diets of different abrasiveness". Animal Physiology and Animal Nutrition. doi:10.1111/jpn.12226. ↑ 4.0 4.1 4.2 4.3 4.4 4.5 Waggoner, Ben (15 August 2000). "Introduction to the Rodentia". University of California Museum of Paleontology. สืบค้นเมื่อ 4 July 2014. ↑ 5.0 5.1 5.2 5.3 5.4 5.5 Nowak, R. M. (1999). Walker's Mammals of the World. Johns Hopkins University Press. p. 1244. ISBN 0-8018-5789-9. ↑ Blashfield, Jean F. "Rodents". Science Encyclopedia. สืบค้นเมื่อ 14 July 2014. ↑ Niemiec, Brook A. (15 October 2011). Small Animal Dental, Oral and Maxillofacial Disease: A Colour Handbook. CRC Press. p. 13. ISBN 978-1-84076-630-1. ↑ Cox, Philip G.; Jeffery, Nathan (2011). "Reviewing the Morphology of the Jaw-Closing Musculature in Squirrels, Rats, and Guinea Pigs with Contrast-Enhanced MicroCT". The Anatomical Record. 294: 915–928. doi:10.1002/ar.21381. ↑ Duckett, W. (1853). "cheek pouch". English conversation and reading. Ed Michel Levi. p. 3. ↑ Mustapha, O. (2015). "Morphology of the Oral Cavity of the African Giant Rat". Bulgarian Journal of Veterinary Medicine. 18 (1): 19–30. doi:10.15547/bjvm.793. ↑ 11.0 11.1 11.2 Stefoff, Rebecca (2008). The Rodent Order. Marshall Cavendish. pp. 62–63, 71–73. ISBN 978-0-7614-3073-5. ↑ Thorington, R. W Jr.; Darrow, K.; Anderson, C. G. (1998). "Wing tip anatomy and aerodynamics in flying squirrels" (PDF). Journal of Mammalogy. 79 (1): 245–250. doi:10.2307/1382860. JSTOR 1382860. ↑ Schulte-Hostedde, A. I. (2008). "Chapter 10: Sexual Size Dimorphism in Rodents". In Wolff, Jerry O.; Sherman, Paul W. Rodent Societies: An Ecological and Evolutionary Perspective. University of Chicago Press. pp. 117–119. ISBN 978-0-226-90538-9. ↑ Helgen, Kristofer M. (2005). "The amphibious murines of New Guinea (Rodentia, Muridae): the generic status of Baiyankamys and description of a new species of Hydromys". Zootaxa. 913: 1–20. ISSN 1175-5326. ↑ Parshad, V.R. (1999). "Rodent control in India" (PDF). Integrated Pest Management Reviews. 4: 97–126. doi:10.1023/A:1009622109901. ↑ 16.0 16.1 Janke, Axel; Martínez-Estévez, Lourdes; Balvanera, Patricia; Pacheco, Jesús; Ceballos, Gerardo (2013). "Prairie dog decline reduces the supply of ecosystem services and leads to desertification of semiarid grasslands". PLOS ONE. 8 (10): e75229. Bibcode:2013PLoSO...875229M. doi:10.1371/journal.pone.0075229. ISSN 1932-6203. PMC 3793983. PMID 24130691. ↑ Krueger, Kirsten (1986). "Feeding relationships among bison, pronghorn, and prairie dogs: an experimental analysis". Ecology. 67 (3): 760–770. doi:10.2307/1937699. ISSN 0012-9658. ↑ Pérez, Francisco; Castillo-Guevara, Citlalli; Galindo-Flores, Gema; Cuautle, Mariana; Estrada-Torres, Arturo (2012). "Effect of gut passage by two highland rodents on spore activity and mycorrhiza formation of two species of ectomycorrhizal fungi (Laccaria trichodermophora and Suillus tomentosus)". Botany. 90 (11): 1084–1092. doi:10.1139/b2012-086. ISSN 1916-2790. ↑ Burchsted, D.; Daniels, M.; Thorson, R.; Vokoun, J. (2010). "The river discontinuum: applying beaver modifications to baseline conditions for restoration of forested headwaters". BioScience. 60 (11): 908–922. doi:10.1525/bio.2010.60.11.7. ↑ Wright, J. P.; Jones, C. G.; Flecker, A. S. (2002). "An ecosystem engineer, the beaver, increases species richness at the landscape scale" (PDF). Oecologia. 132 (1): 96–101. Bibcode:2002Oecol.132...96W. doi:10.1007/s00442-002-0929-1. ↑ Kemp, P. S.; Worthington, T. A.; Langford, T. E. l.; Tree, A. R. J.; Gaywood, M. J. (2012). "Qualitative and quantitative effects of reintroduced beavers on stream fish". Fish and Fisheries. 13 (2): 158–181. doi:10.1111/j.1467-2979.2011.00421.x. ↑ Hansson, Lennart (1971). "Habitat, food and population dynamics of the field vole Microtus agrestis (L.) in south Sweden". Viltrevy. 8: 268–278. ISSN 0505-611X. Archived from the original on 27 September 2013. ↑ Connior, M. B. (2011). "Geomys bursarius (Rodentia: Geomyidae)". Mammalian Species. 43 (1): 104–117. doi:10.1644/879.1. 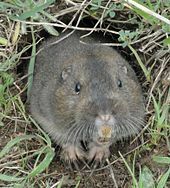 ↑ "Texan pocket gopher". The Mammals of Texas: Rodents. NSRL: Museum of Texas Tech University. สืบค้นเมื่อ 4 July 2014. ↑ 25.0 25.1 25.2 Attenborough, David (2002). The Life of Mammals. BBC Books. pp. 61–86. ISBN 978-0-563-53423-5. ↑ Müller-Schwarze, Dietland; Sun, Lixing (2003). The Beaver: Natural History of a Wetlands Engineer. Cornell University Press. pp. 67–75. ISBN 978-0-8014-4098-4. ↑ 27.0 27.1 Landry, Stuart O. Jr. (1970). "The Rodentia as omnivores". The Quarterly Review of Biology. 45 (4): 351–372. doi:10.1086/406647. JSTOR 2821009. ↑ "Hydromys chrysogaster: Water rat". Water for a healthy country. CSIRO. 30 June 2004. สืบค้นเมื่อ 4 July 2014. 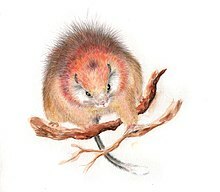 ↑ "Northern grasshopper mouse". The Mammals of Texas: Rodents. NSRL: Museum of Texas Tech University. สืบค้นเมื่อ 4 July 2014. ↑ Jarvis, Jennifer (1981). "Eusociality in a Mammal: Cooperative Breeding in Naked Mole-Rat Colonies". Science. 212 (4494): 571–573. Bibcode:1981Sci...212..571J. doi:10.1126/science.7209555. JSTOR 1686202. ↑ 31.0 31.1 Hoogland, John L. (1995). The Black-Tailed Prairie Dog: Social Life of a Burrowing Mammal. University of Chicago Press. p. 1. ISBN 978-0-226-35118-6. ↑ Baker, Bruce W.; Hill, Edward P. (2003). "Chapter 15: Beaver". In Feldhamer, George A.; Thompson, Bruce C.; Chapman, Joseph A. Wild Mammals of North America: Biology, Management, and Conservation. JHU Press. pp. 288–310. ISBN 978-0-8018-7416-1. ↑ Hanson, Anne (25 October 2006). "Wild Norway rat behavior". Rat behavior and biology. สืบค้นเมื่อ 1 July 2014. ↑ Winslow, James T.; Hastings, Nick; Carter, C. Sue; Harbaugh, Carroll R.; Insel, Thomas R. (1993). "A role for central vasopressin in pair bonding in monogamous prairie voles" (PDF). Letters to Nature. 365 (6446): 545–548. Bibcode:1993Natur.365..545W. doi:10.1038/365545a0. PMID 8413608. Archived from the original (PDF) on 14 July 2014. ↑ Yensen, Eric; Sherman, Paul W. (2003). "Chapter 10: Ground Squirrels". In Feldhamer, George A.; Thompson, Bruce C.; Chapman, Joseph A. Wild Mammals of North America: Biology, Management, and Conservation. JHU Press. pp. 211–225. ISBN 978-0-8018-7416-1. ↑ 36.0 36.1 Jarvis, Jennifer (1981). "Eusociality in a mammal: Cooperative breeding in naked mole-rat colonies". Science. 212 (4494): 571–573. Bibcode:1981Sci...212..571J. doi:10.1126/science.7209555. JSTOR 1686202. ↑ Bennett, N. C.; Jarvis, J. U. M. (2004). "Cryptomys damarensis". Mammalian Species. 756: Number 756: pp. 1–5. doi:10.1644/756. ↑ Arakawa, Hiroyuki; Blanchard, D. Caroline; Arakawa, Keiko; Dunlap, Christopher; Blanchard, Robert J. (2008). "Scent marking behavior as an odorant communication in mice". Neuroscience and Biobehavioral Reviews. 32 (7): 1236–1248. doi:10.1016/j.neubiorev.2008.05.012. PMC 2577770. ↑ Holmes, Warren G.; Mateo, Jill M. (2008). "Chapter 19: Kin Recognition in Rodents: Issues and Evidence". In Wolff, Jerry O.; Sherman, Paul W. Rodent Societies: An Ecological and Evolutionary Perspective. University of Chicago Press. pp. 216–230. ISBN 978-0-226-90538-9. ↑ 40.0 40.1 Sherwin, C.M. (2002). "Comfortable quarters for mice in research institutions". In Viktor and Annie Reinhardt. Comfortable Quarters For Laboratory Animals (9 ed.). Animal Welfare Institute. Archived from the original on 6 October 2014. ↑ Bjorkoyli, Tore; Rosell, Frank (2002). "A test of the dear enemy phenomenon in the Eurasian beaver". Animal Behaviour. 63 (6): 1073–1078. doi:10.1006/anbe.2002.3010. ↑ Vaché, M.; Ferron, J.; Gouat, P. (2001). "The ability of red squirrels (Tamiasciurus hudsonicus) to discriminate conspecific olfactory signatures". Canadian Journal of Zoology. 79 (7): 1296–1300. doi:10.1139/z01-085. ↑ Shelley, Erin L.; Blumstein, Daniel T. (2005). "The evolution of vocal alarm communication in rodents". Behavioral Ecology. 16 (1): 169–177. doi:10.1093/beheco/arh148. ↑ Slobodchikoff, C. N.; Paseka, Andrea; Verdolin, Jennifer L (2009). "Prairie dog alarm calls encode labels about predator colors" (PDF). Animal Cognition. 12 (3): 435–439. doi:10.1007/s10071-008-0203-y. ↑ Zimmermann, Elke; Leliveld, Lisette; Schehka, Lisette (2013). "8: Toward the evolutionary roots of affective prosody in human acoustic communication: A comparative approach to mammalian voices". In Altenmüller, Eckart; Schmidt, Sabine; Zimmermann, Elke. The Evolution of Emotional Communication: From Sounds in Nonhuman Mammals to Speech and Music in Man. Oxford University Press. pp. 123–124. ISBN 978-0-19-164489-4. ↑ Long, C. V. (2007). Vocalisations of the degu (Octodon degus), a social caviomorph rodent. Bioacoustics. 16. pp. 223–244. doi:10.1080/09524622.2007.9753579. ISSN 0952-4622. ↑ Ancillotto, Leonardo; Sozio, Giulia; Mortelliti, Alessio; Russo, Danilo (2014). "Ultrasonic communication in Gliridae (Rodentia): the hazel dormouse (Muscardinus avellanarius) as a case study". Bioacoustics. 23 (2): 129–141. doi:10.1080/09524622.2013.838146. ↑ Panksepp, Jaak; Burgdorf, Jeff (2003). ""Laughing" rats and the evolutionary antecedents of human joy?". Physiology & Behavior. 79 (3): 533–547. doi:10.1016/S0031-9384(03)00159-8. PMID 12954448. ↑ Haverkamp, Silke; Waessle, Heinz; Duebel, Jens; Kuner, Thomas; Augustine, George J.; Feng, Guoping; Euler, Thomas (2005). "The primordial, blue-cone color system of the mouse retina" (PDF). Journal of Neuroscience. 25 (22): 5438–5445. doi:10.1523/JNEUROSCI.1117-05.2005. PMID 15930394. ↑ Hanson, Anne. "What do rats see?". Rat behavior and biology. สืบค้นเมื่อ 1 July 2014. ↑ Pickrell, John (8 July 2003). "Urine vision? How rodents communicate with UV light". National Geographic News. สืบค้นเมื่อ 8 July 2014. ↑ Desjardins, C.; Maruniak, J. A.; Bronson, F. H. (1973). "Social rank in house mice: Differentiation revealed by ultraviolet visualization of urinary marking patterns". Science. 182 (4115): 939–941. Bibcode:1973Sci...182..939D. doi:10.1126/science.182.4115.939. PMID 4745598. ↑ Viitala, J.; Korpimäki, E.; Palokangas, P.; Koivula, M. (1995). "Attraction of kestrels to vole scent marks visible in ultraviolet light". Nature. 373 (6513): 425–427. Bibcode:1995Natur.373..425V. doi:10.1038/373425a0. ↑ 55.0 55.1 55.2 "Vibrational communication in mammals". Map of Life: Convergent evolution online. University of Cambridge. 4 August 2010. สืบค้นเมื่อ 5 July 2014. ↑ Randall, J. A. (2001). "Evolution and function of drumming as communication in mammals". American Zoologist. 41: 1143–1156. doi:10.1093/icb/41.5.1143. ↑ Randall, Jan A.; Matocq, Marjorie D. (1997). "Why do kangaroo rats (Dipodomys spectabilis) footdrum at snakes?". Behavioral Ecology. 8: 404–413. doi:10.1093/beheco/8.4.404. ↑ Narins, P. M.; Reichman, O. J.; Jarvis, J. U. M.; Lewis, E. R. (1992). "Seismic signal transmission between burrows of the Cape mole-rat Georychus capensis". Journal of Comparative Physiology [A]. 170: 13–22. doi:10.1007/BF00190397. ↑ 59.0 59.1 59.2 59.3 Waterman, Jane (2008). "Chapter 3: Male Mating Strategies in Rodents". In Wolff, Jerry O.; Sherman, Paul W. Rodent Societies: An Ecological and Evolutionary Perspective. University of Chicago Press. pp. 28–39. ISBN 978-0-226-90538-9. ↑ 60.0 60.1 Soloman, Nancy G.; Keane, Brain (2008). "Chapter 4: Reproductive Strategies in Female Rodents". In Wolff, Jerry O.; Sherman, Paul W. Rodent Societies: An Ecological and Evolutionary Perspective. University of Chicago Press. pp. 42–52. ISBN 978-0-226-90538-9. ↑ 61.0 61.1 McGuire, Betty; Bernis, William E. (2008). "Chapter 20: Parental Care". In Wolff, Jerry O.; Sherman, Paul W. Rodent Societies: An Ecological and Evolutionary Perspective. University of Chicago Press. pp. 231–235. ISBN 978-0-226-90538-9. ↑ Holmes, Warren G.; Mateo, Jill M. (2008). "Chapter 19: Kin Recognition in Rodents: Issues and Evidence". In Wolff, Jerry O.; Sherman, Paul W. Rodent Societies: An Ecological and Evolutionary Perspective. University of Chicago Press. pp. 226–227. ISBN 978-0-226-90538-9. ↑ 63.0 63.1 Ebensperger, Luis A.; Blumsperger, Daniel T. (2008). "Chapter 23: Nonparental Infanticide". In Wolff, Jerry O.; Sherman, Paul W. Rodent Societies: An Ecological and Evolutionary Perspective. University of Chicago Press. pp. 274–278. ISBN 978-0-226-90538-9. ↑ Hoogland, J. L. (1985). "Infanticide in prairie dogs: Lactating females kill offspring of close kin". Science. 230 (4729): 1037–1040. Bibcode:1985Sci...230.1037H. doi:10.1126/science.230.4729.1037. PMID 17814930. ↑ Hackländera, Klaus; Möstlb, Erich; Arnold, Walter (2003). 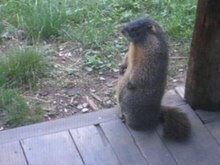 "Reproductive suppression in female Alpine marmots, Marmota marmota". Animal Behaviour. 65 (6): 1133–1140. doi:10.1006/anbe.2003.2159. ↑ 67.0 67.1 Robbins, Robert J. (1980). "Taste-Aversion Learning and its Implication for Rodent Control". ↑ 68.0 68.1 Charters, Jessie Blount Allen (1904). "The associative processes of the guinea pig: A study of the psychical development of an animal with a nervous system well medullated at birth". Journal of Comparative Neurology and Psychology. University of Chicago Press. XIV (4): 300–337. ↑ Jacobs, Lucia F.; Liman, Emily R. (1991). "Grey squirrels remember the locations of buried nuts" (PDF). Animal Behaviour. 41: 103–110. doi:10.1016/s0003-3472(05)80506-8. ↑ Jacobs, Lucia F. (1992). "Memory for cache locations in Merriam's kangaroo rats" (PDF). Animal Behaviour. 43 (4): 585–593. doi:10.1016/S0003-3472(05)81018-8. Archived from the original (PDF) on 26 August 2014. ↑ Harding, E. J.; Paul, E. S.; Mendl, M. (2004). "Animal behaviour: Cognitive bias and affective state". Nature. 427 (6972): 312. Bibcode:2004Natur.427..312H. doi:10.1038/427312a. PMID 14737158. ↑ Rygula, Rafal; Pluta, Helena; Popik, Piotr (2012). "Laughing rats are optimistic". PLOS ONE. 7 (12): e51959. Bibcode:2012PLoSO...751959R. doi:10.1371/journal.pone.0051959. PMC 3530570. PMID 23300582. ↑ Carlyle, Kim (8 March 2007). "Rats capable of reflecting on mental processes". University of Georgia. สืบค้นเมื่อ 13 August 2014. ↑ Foote, Allison L.; Crystal, J. D. (2007). "Metacognition in the rat". Current Biology. 17 (6): 551–555. doi:10.1016/j.cub.2007.01.061. PMC 1861845. PMID 17346969. ↑ Smith, J. David; Beran, M. J.; Couchman, J. J.; Coutinho, M. V. C. (2008). "The comparative study of metacognition: Sharper paradigms, safer inferences". Psychonomic Bulletin & Review. 15 (4): 679–691. doi:10.3758/PBR.15.4.679. ↑ Jozefowiez, J.; Staddon, J. E. R.; Cerutti, D. T. (2009). "Metacognition in animals: how do we know that they know?". Comparative Cognition & Behavior Reviews. 4: 29–39. doi:10.3819/ccbr.2009.40003. ↑ Hanson, Anne (2012). "How do rats choose what to eat?". Rat behavior and biology. สืบค้นเมื่อ 24 August 2014. ↑ Galef, Bennett G.; Laland, Kevin N. (June 2005). "Social Learning in Animals: Empirical Studies and Theoretical Models". BioScience. 55 (6): 489–499. doi:10.1641/0006-3568(2005)055[0489:sliaes]2.0.co;2. JSTOR 10.1641/0006-3568%282005%29055%5B0489%3ASLIAES%5D2.0.CO%3B2. ↑ Douzery, E. J. P.; Delsuc, F.; Stanhope, M. J.; Huchon, D. (2003). "Local molecular clocks in three nuclear genes: divergence times for rodents and other mammals and incompatibility among fossil calibrations". Journal of Molecular Evolution. 57: S201–13. Bibcode:2003JMolE..57S.201D. doi:10.1007/s00239-003-0028-x. PMID 15008417. ↑ Horner, D. S.; Lefkimmiatis, K.; Reyes, A.; Gissi, C.; Saccone, C.; Pesole, G. (2007). "Phylogenetic analyses of complete mitochondrial genome sequences suggest a basal divergence of the enigmatic rodent Anomalurus". BMC Evolutionary Biology. 7 (1): 16. doi:10.1186/1471-2148-7-16. PMC 1802082. PMID 17288612. ↑ Wood, D. Joseph (2010). The Extinction of the Multituberculates Outside North America: a Global Approach to Testing the Competition Model (M.S.). The Ohio State University. ↑ Schenk, John J.; Rowe, Kevin C.; Steppan, Scott J. (2013). "Ecological opportunity and incumbency in the diversification of repeated continental colonizations by muroid rodents". Systematic Biology. 62 (6): 837–864. doi:10.1093/sysbio/syt050. PMID 23925508. ↑ Hopkins, Samantha S.B. (2005). "The evolution of fossoriality and the adaptive role of horns in the Mylagaulidae (Mammalia: Rodentia)". Proceedings of the Royal Society B. 272 (1573): 1705–1713. doi:10.1098/rspb.2005.3171. PMC 1559849. PMID 16087426. ↑ Samuels, Joshua X.; Zancanella, John (2011). "An early hemphillian occurrence of Castor (Castoridae) from the Rattlesnake Formation of Oregon" (PDF). Journal of Paleontology. 85 (5): 930–935. doi:10.1666/11-016.1. ↑ 86.0 86.1 Marivaux, Laurent; Essid, El Mabrouk; Marzougui, Wissem; Ammar, Hayet Khayati; Adnet, Sylvain; Marandat, Bernard; Merzeraud, Gilles; Tabuce, Rodolphe; Vianey-Liaud, Monique (2014). "A new and primitive species of Protophiomys (Rodentia, Hystricognathi) from the late middle Eocene of Djebel el Kébar, Central Tunisia". Palaeovertebrata. 38 (1): 1–17. ↑ Gheerbrant, Emmanuel; Rage, Jean-Claude (2006). "Paleobiogeography of Africa: How distinct from Gondwana and Laurasia?". Palaeogeography, Palaeoclimatology, Palaeoecology. 241: 224–246. doi:10.1016/j.palaeo.2006.03.016. ↑ Vélez-Juarbe, Jorge; Martin, Thomas; Macphee, Ross D. E. (2014). "The earliest Caribbean rodents: Oligocene caviomorphs from Puerto Rico". Journal of Vertebrate Paleontology. 34 (1): 157–163. doi:10.1080/02724634.2013.789039. ↑ Ali, J. R.; Huber, M. (2010-01-20). "Mammalian biodiversity on Madagascar controlled by ocean currents". Nature. Nature Publishing Group. 463 (4 Feb. 2010): 653–656. Bibcode:2010Natur.463..653A. doi:10.1038/nature08706. PMID 20090678. สืบค้นเมื่อ 2010-01-20. ↑ 90.0 90.1 Kay, Emily H.; Hoekstra, Hopi E. (2008). "Rodents". Current Biology. 18 (10): R406–R410. doi:10.1016/j.cub.2008.03.019. ↑ Vekua, A.; Bendukidze, O.; Bukhsianidze, M.; Vanishvili, N.; Augusti, J.; Martinez-Navarro, B.; Rook, L. (2010). 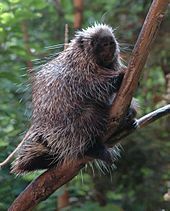 "Porcupine in the Late Neogene and Quaternary of Georgia" (PDF). Bulletin of the Georgian National Academy Of Sciences. 4 (3): 140–149. Archived from the original (PDF) on 16 July 2014. ↑ "Giant beaver". Natural History Notebooks. Canadian Museum of Nature. 28 May 2013. สืบค้นเมื่อ 19 October 2014. ↑ Rinderknecht, Andrés; Blanco, R. Ernesto (2008). 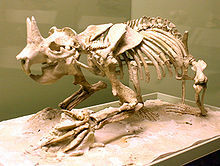 "The largest fossil rodent". Proceedings of the Royal Society B. 275 (1637): 923–928. doi:10.1098/rspb.2007.1645. PMC 2599941. PMID 18198140. ↑ Breed, Bill; Ford, Fred (2007). Native Mice and Rats (PDF). CSIRO Publishing. pp. 3, 5, and passim. ISBN 978-0-643-09166-5. ↑ "The Action Plan for Australian Rodents". Environment Australia. 1 April 1995. สืบค้นเมื่อ 18 September 2014. ↑ Rowe, K. C.; Reno, M. L.; Richmond, D. M.; Adkins, R. M.; Steppan, S. J. (2008). "Pliocene colonization and adaptive radiations in Australia and New Guinea (Sahul): multilocus systematics of the old endemic rodents (Muroidea: Murinae)". Molecular Phylogenetics and Evolution. 47 (1): 84–101. doi:10.1016/j.ympev.2008.01.001. PMID 18313945. ↑ Baskin, Jon A.; Thomas, Ronny G. (2007). "South Texas and the Great American Interchange" (PDF). Gulf Coast Association of Geological Societies Transactions. 57: 37–45. Archived from the original (PDF) on 18 July 2014. ↑ Marshall, L. G.; Butler, R. F.; Drake, R. E.; Curtis, G. H.; Tedford, R. H. (1979). "Calibration of the Great American Interchange". Science. 204 (4390): 272–279. Bibcode:1979Sci...204..272M. doi:10.1126/science.204.4390.272. PMID 17800342. ↑ 99.0 99.1 Smith, Margaret F.; Patton, James L. (1999). "Phylogenetic relationships and the radiation of Sigmodontine rodents in South America: evidence from cytochrome b". Journal of Mammalian Evolution. 6 (2): 89–128. doi:10.1023/A:1020668004578. ↑ 100.0 100.1 Parada, A.; Pardiñas, U. F. J.; Salazar-Bravo, J.; D’Elía, G.; Palma, R. E. (March 2013). "Dating an impressive Neotropical radiation: Molecular time estimates for the Sigmodontinae (Rodentia) provide insights into its historical biogeography". Molecular Phylogenetics and Evolution. 66 (3): 960–968. doi:10.1016/j.ympev.2012.12.001. PMID 23257216. ↑ Steppan, Scott J. (18 April 2006). "Rodentia". Tree of Life Web Project. สืบค้นเมื่อ 14 July 2014. ↑ "rodent (n.)". Online Etymology Dictionary. สืบค้นเมื่อ 7 May 2015. ↑ Smith, Andrew T. "Lagomorph". Encyclopædia Britannica. Encyclopædia Britannica. สืบค้นเมื่อ 11 August 2014. ↑ Wu, Shaoyuan; Wu, Wenyu; Zhang, Fuchun; Ye, Jie; Ni, Xijun; Sun, Jimin; Edwards, Scott V.; Meng, Jin; Organ, Chris L. (2012). "Molecular and paleontological evidence for a post-Cretaceous origin of rodents". PLoS ONE. 7 (10): e46445. Bibcode:2012PLoSO...746445W. doi:10.1371/journal.pone.0046445. PMC 3465340. PMID 23071573. ↑ Fabre; และคณะ (2012). "A glimpse on the pattern of rodent diversification: a phylogenetic approach". BMC Evolutionary Biology. 12: 88. doi:10.1186/1471-2148-12-88. PMC 3532383. PMID 22697210. สืบค้นเมื่อ 30 December 2015. ↑ 106.0 106.1 Wood, Albert E. (1955). "A Revised Classification of the Rodents". Journal of Mammalogy. 36 (2): 165–187. doi:10.2307/1375874. JSTOR 1375874. ↑ Wood, Albert E. (1958). "Are there rodent suborders?". Systematic Biology. 7 (4): 169–173. doi:10.2307/2411716. JSTOR 2411716. ↑ Carleton, M. D.; Musser, G. G. (2005). "Order Rodentia". In Wilson, Don E.; Reeder, DeeAnn M. Mammal Species of the World – a taxonomic and geographic reference. 12. JHU Press. pp. 745–752. ISBN 978-0-8018-8221-0. ↑ Honeycutt, Rodney L. (2009). "Rodents (Rodentia)" (PDF). In Hedges, S.B. ; Kumar, S. The Timetree of Life. Oxford University Press. ↑ 110.0 110.1 Amori, G.; Gippoliti, S. (2003). "A higher-taxon approach to rodent conservation priorities for the 21st century". Animal Biodiversity and Conservation. 26 (2): 1–18. ↑ Morgan, G. S. (1993). "Quaternary land vertebrates of Jamaica". Geological Society of America Memoir. Geological Society of America Memoirs. 182: 417–442. doi:10.1130/mem182-p417. ISBN 0-8137-1182-7. ↑ "Rodent Conservation Assessment". WAZA. สืบค้นเมื่อ 27 June 2014. ↑ Gudynas, Eduardo (1989). Lidicker, William Zander, ed. Rodents: A World Survey of Species of Conservation Concern: Based on the Proceedings of a Workshop of the IUCN/SSC Rodent Specialist Group, Held at the Fourth International Theriological Congress, August 17, 1985, Edmonton, Alberta, Canada. IUCN. p. 23. ↑ Hindwood, K.A. (1940). "Birds of Lord Howe Island". Emu. 40: 1–86. doi:10.1071/mu940001. ↑ "Lundy puffins back from the brink". BBC Devon. 22 February 2008. สืบค้นเมื่อ 30 June 2014. ↑ Mitchell, Heather (27 May 2014). "Puffins a-plenty? New hope for Lundy and other UK seabird islands". RSPB. สืบค้นเมื่อ 30 June 2014. ↑ Feinstein, Kelly (1 March 2006). "Felting a beaver hat". 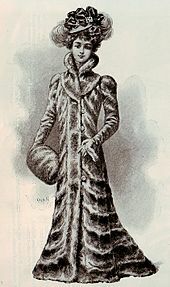 Fashionable Felted Fur. UC Santa Cruz. Archived from the original on 6 October 2014. สืบค้นเมื่อ 24 September 2014. ↑ Innis, Harold A. (1999). The Fur Trade in Canada: An Introduction to Canadian Economic History. University of Toronto Press. pp. 9–12. ISBN 978-0-8020-8196-4. ↑ 120.0 120.1 "Excessive trade: Clothes and trimming". Granby Zoo. สืบค้นเมื่อ 9 August 2014. ↑ "Lakota Quillwork Art and Legend". Akta Lakota Museum and Cultural Center. สืบค้นเมื่อ 29 June 2013. ↑ 122.0 122.1 122.2 122.3 Fiedler, Lynwood A. (1990). "Rodents as a Food Source". Proceedings of the Fourteenth Vertebrate Pest Conference 1990. University of California, Davis: 149–155. ↑ Knowlton, David (13 July 2011). "Guinea Pig, Pet or Festive Meal". Cuzco Eats. Archived from the original on 14 July 2014. สืบค้นเมื่อ 5 July 2014. ↑ Morveli, Walter Coraza; Knowlton, David (5 March 2012). "Traditional Mud Stoves and Ovens Make the Best Food". Cuzco Eats. Archived from the original on 15 July 2014. สืบค้นเมื่อ 6 July 2014. ↑ Wolff, Jerry O.; Sherman, Paul W. (2008). Rodent Societies: An Ecological and Evolutionary Perspective. University of Chicago Press. pp. 3–8. ISBN 978-0-226-90538-9. ↑ Krinke, George J.; Bullock, Gillian R.; Bunton, Tracie (2000). "History, strains and models". The Laboratory Rat (Handbook of Experimental Animals). Academic Press. pp. 3–16. ISBN 0-12-426400-X. ↑ Morse, Herbert C. (1981). "The Laboratory Mouse: A Historical Assessment". In Foster, Henry. The Mouse in Biomedical Research: History, Genetics, and Wild Mice. Elsevier. pp. xi, 1. ISBN 978-0-323-15606-6. ↑ 128.0 128.1 Gad, Shayne C. (2007). Animal Models in Toxicology (2nd ed.). Taylor & Francis. pp. 334–402. ISBN 0-8247-5407-7. ↑ Guerrini, Anita (2003). Experimenting with Humans and Animals. Johns Hopkins. pp. 98–104. ISBN 0-8018-7196-4. ↑ Gray, Tara (1998). "A Brief History of Animals in Space". National Aeronautics and Space Administration. สืบค้นเมื่อ 5 March 2007. ↑ Sherwin, C. M. (2010). "25: The Husbandry and Welfare of Non-traditional Laboratory Rodents". In Hubrecht, R.; Kirkwood, J. UFAW Handbook on the Care and Management of Laboratory Animals. Wiley-Blackwell. pp. 359–369. ↑ Wines, Michael (19 May 2004). "Gambian rodents risk death for bananas". The Age. สืบค้นเมื่อ 21 June 2014. ↑ Mhelela, Hassan (13 September 2012). "Giant rats trained to detect land mines and tuberculosis in Africa". BBC. สืบค้นเมื่อ 27 June 2014. ↑ Bakalar, Nicholas (3 January 2011). "Detecting Tuberculosis: No Microscopes, Just Rats". New York Times. สืบค้นเมื่อ 23 August 2014. ↑ Harder, Ben (1 May 2002). "Scientists "Drive" rats by remote control". National Geographic. สืบค้นเมื่อ 9 November 2013. ↑ Solon, O. (9 September 2013). "Man's mission to build remote control systems for dogs, roaches and sharks". Wired. Archived from the original on 4 November 2013. สืบค้นเมื่อ 9 December 2013. ↑ Xu, S.; Talwar, S. K.; Hawley, E. S.; Li, L.; Chapin, J. K. (2004). "A multi-channel telemetry system for brain microstimulation in freely roaming animals". Journal of Neuroscience Methods. 133 (1–2): 57–63. doi:10.1016/j.jneumeth.2003.09.012. PMID 14757345. 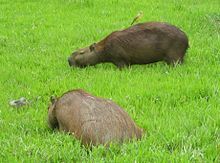 ↑ "Guinea pigs". RSPCA. 2014. สืบค้นเมื่อ 21 June 2014. ↑ "Pet Rodents". RSPCA. 2014. สืบค้นเมื่อ 21 June 2014. ↑ Broekel, Ray (1983). Gerbil Pets and Other Small Rodents. Childrens Press. pp. 5–20. ISBN 978-0-516-01679-5. ↑ Meerburg, B. G.; Singleton, G. R; Leirs, H. (2009). "The Year of the Rat ends: time to fight hunger!". Pest Management Science. 65 (4): 351–2. doi:10.1002/ps.1718. PMID 19206089. ↑ 143.0 143.1 Stenseth, Nils Chr; Leirs, Herwig; Skonhoft, Anders; Davis, Stephen A.; Pech, Roger P.; Andreassen, Harry P.; Singleton, Grant R.; Lima, Mauricio; Machang'u, Robert S.; Makundi, Rhodes H.; Zhang, Zhibin; Brown, Peter R.; Shi, Dazhao; Wan, Xinrong (2003). "Mice, rats, and people: The bio-economics of agricultural rodent pests". Frontiers in Ecology and the Environment. 1 (77): 367–375. doi:10.2307/3868189. JSTOR 3868189. ↑ Meerburg, B. G.; Singleton, G. R.; Kijlstra, A. (2009). "Rodent-borne diseases and their risks for public health". Critical Reviews in Microbiology. 35 (3): 221–70. doi:10.1080/10408410902989837. PMID 19548807. ↑ McCormick, M. (2003). "Rats, communications, and plague: Toward an ecological history" (PDF). Journal of Interdisciplinary History. 34 (1): 1–25. doi:10.1162/002219503322645439. Archived from the original (PDF) on 22 February 2015. ↑ "Rodent-borne diseases". European Centre for Disease Prevention and Control. Archived from the original on 3 September 2014. สืบค้นเมื่อ 1 September 2014. ↑ "Diseases indirectly transmitted by rodents". Centers for Disease Control and Prevention. 2012. สืบค้นเมื่อ 1 September 2014. ↑ Centers for Disease Control and Prevention (2006). Integrated pest management: conducting urban rodent surveys (PDF). Atlanta: US Department of Health and Human Services. ↑ Wodzicki, K. (1973). "Prospects for biological control of rodent populations". Bulletin of the World Health Organization. 48 (4): 461–467. PMC 2481104. PMID 4587482. ↑ "Rodent control in agriculture – an HGCA guide". Agriculture and Horticulture Development Board. 2012. สืบค้นเมื่อ 24 February 2018.